I know what many of you are thinking. “This is just going to be spooky circus music and I can skip this album without any worry since I’m not using a clown theme at my haunt.” I’ll admit it, I tend to avoid circus-themed haunt albums for the same reason. Given that I already have one such album, my tastes tend to lean towards soundtracks that can be used in a variety of haunts. 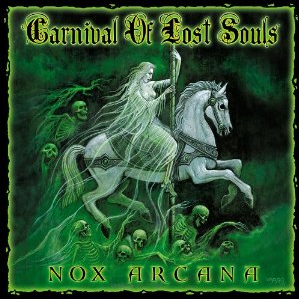 That said, I should have known that Nox Arcana would be the ones to make a circus-themed album that has tracks appropriate for regular and circus-based haunted attractions. “Ghosts of the Midway” offers an atmospheric opening with the sound of a crowd and circus music, followed by Joseph Vargo doing his tradition spoken word introduction to the album as a spooky ringmaster. If you have a fake ringmaster or loudspeaker at the entrance to your haunted circus, you’ll definitely want to have this playing in a loop. “After Hours” features eerie circus music and the occasional soft wail or giggle. The child saying things like “This way” and “Follow Me” coupled with tolling bells is a great touch which also allows the track to be used with a dark or mirror maze (or a dark hallway). The chiming music box-like feel also means that it can be used for use in a haunted playroom scene. An extremely effective piano introduction starts off “Harlequin’s Lament,” whose melancholy tone is enhanced by wails and wordless vocals from dueling choirs of both genders. “Calliope” offers subdued Merry-Go-Round music and chimes that are actually much less peppy than other takes on spooky calliope music I’ve heard. However, this is actually a positive aspect, as it further enhances the creep factor (in addition to the female vocals and giggling, singing children). The sound of coins being dropped into a slot starts the spoken word track “Madame Endora,” in which a raspy old woman’s voice bids you closer for a downbeat fortune. It’s hard to believe that she’s portrayed by the same woman who voiced the White Queen in Winter’s Eve. Although too short to loop, it would work great as audio activated by a motion sensor used with a prop designed to look like a coin-operated fortune telling machine. “Nightmare Parade” gives a sense of pursuit or chase thanks to its pounding music coupled with very soft wailing, cracking whips and bursts of female vocals in the background. For a circus chase scene, I recommend playing this while an evil clown chases guests through a stationary vortex tunnel or fun house hallway. “Shadows Fall” has a very slow dark build whose pounding notes contrast with light piano work. It’s suitable for any spooky room, circus-related or otherwise. “Hall of Mirrors” uses somewhat peppier Merry-Go-Round music with lots of creepy laughter that, despite the name, works in any spooky clown room. But if you want to make your own hall of mirrors to play this track in, I recommend a combination of homemade funhouse mirrors and store bought novelty mirrors. A crackling phonograph player plays some impressive string work and hauntingly hollowed-voice singing in “Spellbound,” but soon the player breaks down and eerie noises start. If you play this in a circus-themed haunt, have some fake loudspeakers set up to imply that this track (and the spoken word segments) are being broadcast through the haunt, while other haunts can use this with a spooky prop record player or phonograph in a haunted parlor scene. “Cries in the Night” offers a creepy chorus of voices and ghostly wails while in “Soul Stealer,” a pipe organ and loud bursts of a unisex chorus switches over the pounding drums and even eerier organ music. The sense of chase and pursuit is also aided by the use of violins. “Haunted Carousel” is a different, darker take on spooky Merry-Go-Round music with plenty of tolling bells and wordless female vocals. “Theatre of Sorrows” combines slow piano work, wordless male vocals, tolling bells and lots of stings in order to provide sense of mystery. In addition to its uses in haunted attractions, I can even see people using this in real life for magic or sideshow performances. “Living Dolls” starts with wind up toy sound effects, followed by music box chimes and a spectral chorus. The sound of a little girl laughing at times is a great creepy touch. Do I even have to provide a suggestion for this one? “Lost in the Darkness” effectively combines the piano, harpsichord and choral work by both genders (which I should note includes our old friends the Gregorian Shadow Choir). This track can work in a wide variety of spooky scenes, including a dark maze. Thanks to the Middle Eastern feel provided by its use of drums, flutes, tambourine and chanting, “Snake Charmer” works well in everything from snake rooms to mummy-themed scenes. It could also work well as backing music in a non-haunt sideshow or bellydance performance. Unlike the other tracks, “Freaks” is a soundscape of chains, heavy breathing and laughter. I suggest using it in a room similar to this one, only with more chains and props like these. Naturally, at least one of the inhabitants is a person pretending to be a static figure like the others filling the room. Pounding drums open “Circus Diabolique” and go nicely with the string work and spectral choir. Vargo’s ringmaster character returns for another spiel (this time backed by a pipe organ). “Pandora’s Music Box” has appropriately music box-sounding chimes, along with a wordless male choir that gets joined by females ghostly wailing. The chimes could allow its use in a haunted nursery or bedroom in addition to a circus themed room. “The Devil’s Daggers” has fast, heavy drum pace set at the beginning, along with a unisex choir. In addition to a spooky knife-throwing scene, it also has potential for a chase scene or a real life performance. Finally, howling wind gives way to pounding drums and string work in “Storm,” which later combines with unisex choral work and thunder effects. Patient listeners who wait long enough will be rewarded with another fortune from Madame Endora, another music box melody and what appears to be a replay of “Spellbound” keeps skipping…only to reveal some awesome guitar riffs. That’s right, it’s an awesome (and extended) rock version of “Spellbound” with special guests Jeff Endemann on lead guitar and Jim Hamar providing the vocals! Released on June 6, 2006 (get it? ), Carnival of Lost Souls is both a great album that offers multiple uses beyond the theme suggested by its title and a fine tribute to Ray Bradbury’s classic novel Something Wicked This Way Comes. As always, the liner notes feature some great artwork and hidden puzzle. No matter what type of haunt setup you have planned, picking up this album will give you plenty of material to use over the years. Those looking for more scenes to do in their haunted circus-themed attraction should try checking out the Monster Maze’s take on one.